Bigmeal Ready to Eat Methi Mutter Malai- A north Indian party dish in which fenugreek leaves and green peas cooked in fresh cream and blend of spices, absolutely delicious with rice , chapatti or roti. Fenugreek leaves are rich in vitamins , potassium and low in cholesterol, give wonderful aroma and unique taste to compliment the sweetness of green peas and cream. 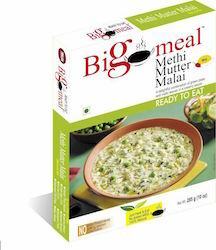 This rich creamy smooth eye catching dish converts methi haters into its ardent fans.